It’s over. Or it’s nearly over. The great influenza pandemic of 2009 – often called the swine flu – has peaked and declined, and it might be over until next year. Not only is it over, but in a remarkable demonstration of evolution at work, it may already have pushed the “old” seasonal flu out of the human population. Further down in this post I’ll show why I think it’s over. I think this is great news, but not surprisingly the conspiracy theorists have to make some wild claims to grab attention while there’s still time. Let me address them first. Wodarg’s resolution calling for an investigation was just passed by the Council of Europe. 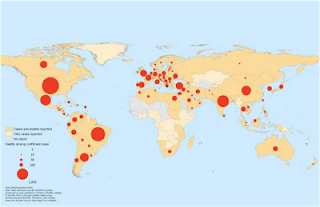 You don’t have to be an epidemiologist to see that this has been a worldwide pandemic, with plenty of deaths. And keep in mind that these are just confirmed deaths due to flu; in many countries where surveillance is minimal or non-existent, we have no idea how many people were infected. It’s true that the number of deaths has been much lower than we feared, but back in the spring of 2009, no one knew how virulent this strain would be. What I’d say to Wodarg (and what Dr. Fukuda might have wanted to say) is: Wodarg, you don’t know what you’re talking about. Your irresponsible claims are doing more harm than good. If you truly care about public health, then educate yourself before you speak out on the flu next time. In the past three pandemics, in 1918, 1957, and 1968, our surveillance wasn’t nearly as good, so maybe there will be two flu seasons this winter. It could happen – we could get a second wave – but I’m putting down my $0.25 that it’s over. Notice something else about this figure? The normal seasonal flu hasn’t been seen at all! The graph shows that virtually all cases are pandemic H1N1 flu. 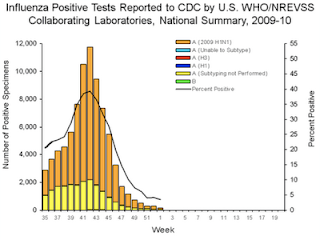 In contrast, here are the past 4 years of flu seasons: See what I mean? 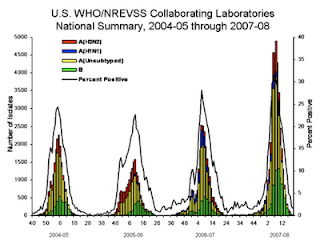 Just one peak each year, and the color-coding shows that the normal seasonal flu is a mixture of H3N1, an older H1N1 (not the new strain), and influenza B. “Sentinel physicians collected 735 respiratory specimens, of which 139 (19%) were positive for influenza virus. This proportion has now decreased for the seventh consecutive week. … Of the 15 486 influenza viruses detected by sentinel networks and subtyped since week 40/2009, 15 393 (99%) were the pandemic virus." So in Europe too the pandemic is on the wane, and the normal seasonal flu strains are virtually absent. For those who follow the evolution of the flu, this is quite remarkable. It means that exposure to pandemic H1N1 provides protection against all three of the seasonal flu strains, and it suggests that a large proportion of the population has been exposed to pandemic flu – otherwise, more people would be getting sick with seasonal flu. Pandemic H1N1 has out-competed the old strains in less than a year – the blink of an eye in evolutionary time. So I think it’s over. But get your H1N1 flu shot! I just got mine. Why? Well, there is a small chance of a second wave, and there’s no downside to the vaccine: after 60 million flu vaccinations in the U.S., there hasn’t been a single reported case of injury due to the vaccine. In addition, the flu might come early again next fall, just as it did this year, and a vaccination now will likely protect you through next season. And finally, don’t forget that vaccinating yourself is also protecting your family, friends, and community. I feel your picking only the big red circle graph to show deaths is misleading. Look down on the CDC's report to the P&I mortality section and you'll see that deaths from H1N1 are not significantly higher than average deaths from the seasonal flu, and are actually much lower than in the 2007-2008 flu season. While I grant the epidemic horizon was crossed for a while, I don't understand why so many people can't admit that there was an over-reaction to H1N1 from almost the very beginning. You are correct that the number of deaths was no worse than for a typical seasonal flu. However, it was much worse for younger people and for pregnant women, who were disproportionately affected. I don't agree that was an over-reaction from the beginning. At the beginning - in April/May 2009 - we didn't know how deadly this would be. It turned out to be mild, so we got lucky. But without a rapid reaction, if it had been deadly, we'd have seen far higher numbers of deaths. Update: other experts are agreeing with this prediction, nearly three weeks later - for example, see http://news.yahoo.com/s/ap/20100205/ap_on_he_me/us_med_swine_flu.